This one was about racial discrimination and secrets among a family. You get to read the old journals with them as they discover family ties they did not know about. <p> Claire series by Tracy Bateman– these were just fun books about the struggles of a single mom, writer etc. <p> Yada yada group gets decked out- by Neta Jackson– I almost did not read this series because of the title. I figured it was a silly stories about women. Was I ever wrong!! This year as the last one in the series and even though it was shorter than the others, it was as hard hitting and straight forward as the others. If you would like a fictional series that makes you stop, look around and think about your life while looking into women’s lives who could be real for all the normal struggles they go through, pick these ones up! So, there is a brief look at some of the books I read, I am sure there are more I am forgetting, but these are the ones that I learned from and stood out to me! Anyhow, we got the house semi-clean after getting home, I made a pot of chicken soup and we are resting. I am so happy actually to have a good excuse to not go anywhere! Our family when we grew up was not really into traditional Christmas. I like it that way, but we did usually always have a nice meal of raviolis, homemade, if we could make them. Some people when I would tell them we had raviolis for Christmas dinner would wrinkle their nose and say “Eeeww!” as the only ones they have had are canned ones! I have actually never had them, but the smell is enough….. Then there are a few people who really dislike them because they would prefer meat filling, or something else and we usually just make cheese as it is easiest. I should have taken pictures, as it is a fun process. I have bought my own ravioli form now to go with my pasta machine roller from Atlas so now I can try out new fillings and will take pictures of myself sometime! I make the pasta dough. I realized the other day the homemade pasta dough must have quite a bit of protein in it, because it has alot of eggs. It is mostly just eggs and flour with a very small amount of oil, like 1/2-1 T. After it is made, I wrap it in plastic wrap and let it rest for 10-20 minutes. I made about 6 balls of dough, I think. You slice the dough into slices and roll very thin with the pasta roller. We do not do it as thin as you can get it for ravioli as it tends to make holes, but instead of going to a 9 thickness, we do a 5 or 6. It is a two person job as one person feeds and guides the long sheet of dough out while one turns the crank. We then hand it off to the next person who places it on the ravioli form, fills, rolls it and cuts them. We filled them all with cheese filling which was ricotta, romano cheese, with eggs and spices. I like the meat filling really well myself with spinach! After this we place them on cookie sheets lined with wax paper and coated with flour and layer them on there. We then put the trays in the freezer to freeze until solid and then remove them to ziplock bags. It is labor intensive, but so many traditions are. I think that it is a great thing to do if you have time to do it, but sometimes like other traditions it gets set aside because people are more important. I think at Christmas time it is important to remember, that like every other time of the year the most important thing. We need to remember to the two greatest commandments, Love the Lord your God with all your heart, soul, mind and strength and Love your neighbor as yourself. I think when so many things in Christmas get to be so important, the traditions of having to get someone a gift or a tradition of not celebrating Christmas, making raviolis or cookies, or others, you fill in the blank. We can forget that these are the two greatest commandments. Our neighbor may be the one who wronged us, they may go out of their way to make us feel bad or so we think. Are there people in your family or friends whom you can think of like that? How can we give the gift of following the 2 greatest commandments this year? Can we not put all the traditions of men above the commandments of God this year and go to this New Year with a better tradition of following His commands and not our ideas of how something should be! Give a gift this year, enjoy the traditions your family has, but think in it all what is the most important and keep your eyes on what is right. I hope you all have a good weekend! I am so happy my husband has some time off this next week and half as he drives school bus and there is no school! Maybe we can get alot of school done ourselves…..maybe? We did finish P.’s reading book, so onto the next one! 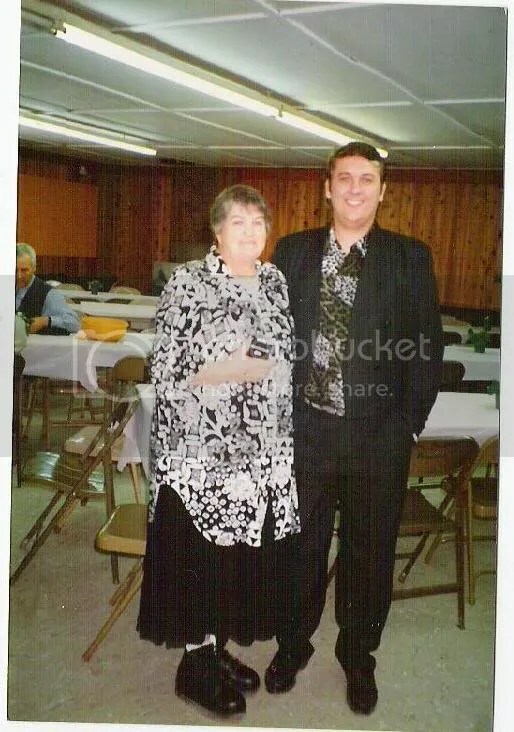 My Grandma at my wedding with my brother- in- law, Peter. Not all of these are the best quality as I had to scan them in and my scanner is not high quality! It is so much better than they used to be, so I am thankful! I remember when we got all excited about scanners, a long time ago! 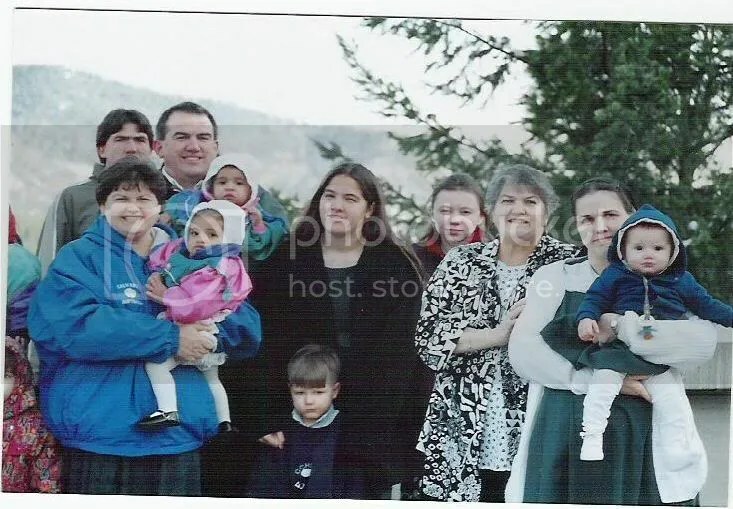 Anyhow, this is some of our favorite relatives with my mom, my grandma and a couple of my siblings who are so small! The girl behind my mom is my sister-in-law’s sister, Marina. This was several years later, Sept. ’03. I had three children already. My cousin J. came up for a visit and we had alot of fun. We drove over to a town where my dad was going to school, to visit my parents as they were living over about 5 hours. We have been really close the last few years especially, but we have written to each other for a long time! My cousin again with my mom and my youngest son, asleep. He slept with his eyes partially open. My cousins daughter and my sister! Just to remind you, here is a more recent picture of most of us! 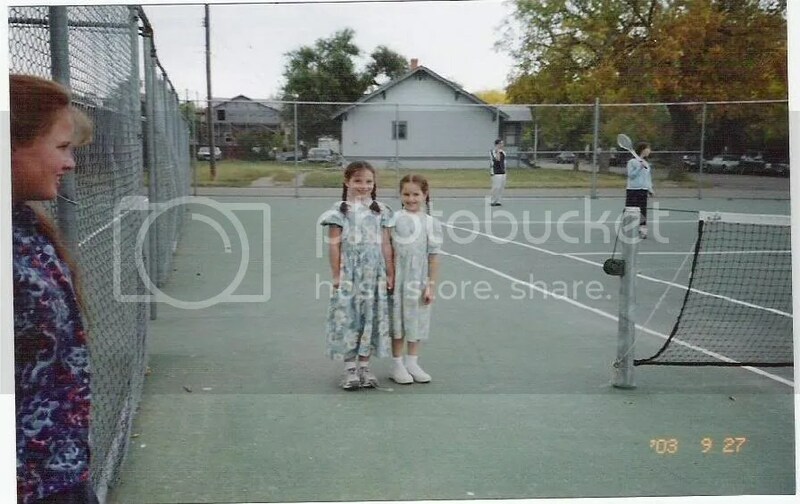 My sister to the left of me (looking at the picture) and the girl below her are the same little girls as in the picture above this one. 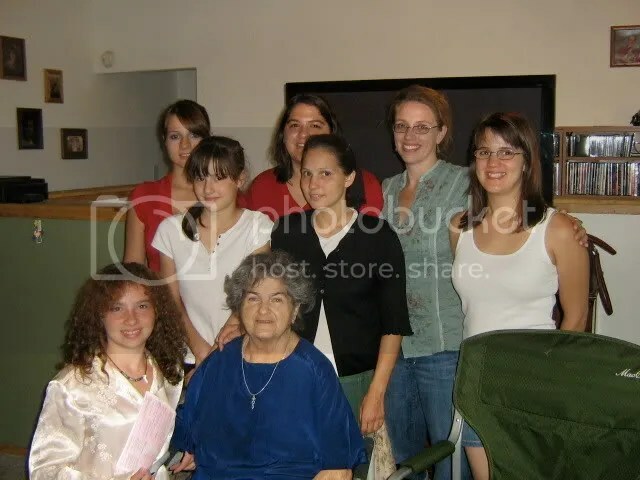 The other cousins look alot like their pictures above so I think you can pick them out. Of course we are with our grandma! 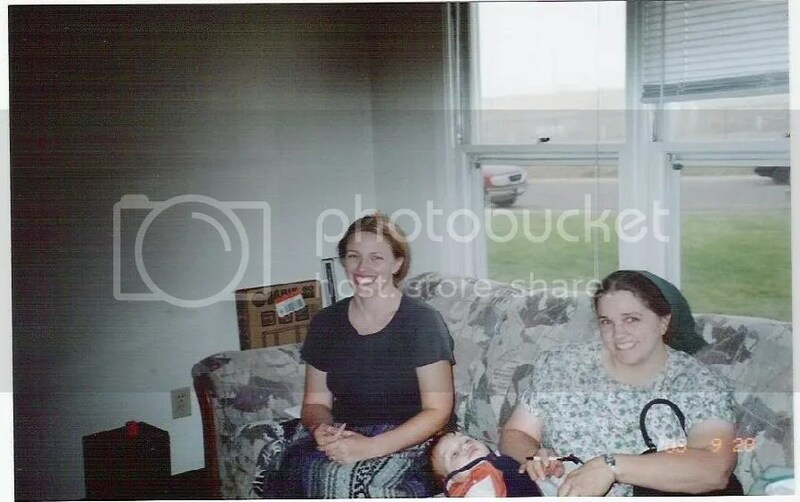 Oh, the baby in one of the top pictures, my mom is holding is the same sister that is to the left of me in the picture here above. Of course, in April that will be 11 years ago…..Yikes! I found these neat kits at Joann’s fabrics yesterday for the boys school. I was looking for some things to do that could be hands on and these were perfect. I applied for and got a 15% discount on stuff on sale or not on sale for school, which helps a little. Anyhow, they are for the old west period and fit as I just got some books about that. H. wants to do a presentation on John Glen though, so I need to get some stuff on that now! <p> It is time to start letting ourselves think about making raviolis! I bought a form this year and my sister did too, so we will have 4 of them to use. I think it will make things easier. I am thinking of making some for me. I want to try a spinach cheese one like the one at Costco and I had a chicken, spinach and romano one once that was really good too. I have some recipes to try! Then of course plain old cheese and then we make one with meat, spinach and Romano cheese. <p> My house is a mess, I need to plan dinner and make some cookies or brownies for the boys club party tonight. It is hard for me to not have the honor of taking care of her anymore, it was something special that we were able to help make her life a little happier this last year, so she could be more independent like she wanted to me. <p> I will never be able to go to eat somewhere probably without hearing her say "Eat something more than salad, for me." or "Promise me you will eat, sweetheart." <p> Another good memory is grandma, having trouble walking or standing and standing up to give someone else her chair or trying to clean the table!!! I have a feeling that will be me when I am older though! This is a recipe I came up with trying to make a cross between a tortilla soup and chili! It is really good! chili powder 2-3 t. apx. Cook on low 8 hours in your crockpot. Debone chicken, put back in chili, add 1/2 t. cumin and 1/4 c. chopped fresh cilantro. Serve topped with grated cheese and tortilla chips crushed. I had to go do some shopping today and I tend to avoid stores this time of year, but saw that the mall opened really early this morning. I decided to go there for fun sort of and do the rest of my shopping too, so I would not be gone all day. <p> I got to Herberger’s and they gave me a free chocolate bar and a coupon. They said to open it and when I did, I had won a free $10 gift card! It was such a nice surprise, it really made my day. What was really nice, is usually they are so expensive that would not go far, but they had some good doorbuster sales and I found a sweater/jacket for under $10 that is so nice and warm! It was perfect!<p> It was a really nice birthday present! <p> I also was able to go to some second hand stores and found 3 pairs of nice ice skates, 2 were in great shape, almost new looking, and one will work for my husband. He does not want to skate alot, but sometimes, I thought it would be fun. I have not gone in a long time so I have a feeling I should wear alot of padding when I go ! I got a couple other pairs from a friend and if I find one more, we will have enough for the whole family. We are off to my niece’s birthday party! She is 8 years old already, my youngest niece and she is the last girl born to our family so far. We have alot of little boys and are lacking in the little girls a bit. I realized today that I have a harder time thinking about what little girls like.